HURRICANE SANDY POUNDED the Bahamas this morning as it careened toward the eastern United States after claiming 21 lives in the Caribbean, including 11 people killed in eastern Cuba. US forecasters downgraded the storm to a category one hurricane late yesterday after it wreaked havoc in Jamaica, Cuba, the Bahamas and Haiti, downing power lines, damaging hundreds of homes and ruining crops. Forecast models predict that Sandy could collide with a seasonal “nor’easter” weather system before hurtling up the US East Coast with potentially devastating fury. “The high degree of blocking from eastern North America across the entire Atlantic Basin is expected to allow this unusual merger to take place,” said forecasters at the Miami-based US National Hurricane Center. The NHC said Sandy was packing sustained winds of 150 kilometres per hour with higher gusts as it moved north as a category one storm on the five-point Saffir-Simpson wind scale. The Bahamas were still bearing the brunt of the storm, with power and phone lines downed, tourists stranded and trees uprooted. Schools, government offices, airports and bridges were to remain closed today. At 3am, the hurricane was passing near Eleuthera Island in the northwestern Bahamas, moving northwest at around 13 miles per hour. The system was expected to weaken further in the next 48 hours but remain a hurricane. Sandy claimed 11 lives in eastern Cuba, including several who died in the rubble of buildings that collapsed in the fury of the massive storm. The hurricane slammed into Cuba, damaging hundreds of homes, flooding crops and downing trees, according to media reports. “It was terrible. Roofs were flying off lots of houses. Doors too, and windows,” said Laquesis Bravo, 36, who lives outside the southeastern coastal city of Santiago de Cuba. Nine people died in Santiago, including a four-month old infant who was among four people who perished when a house caved in. Five more people in the province died during the storm for unspecified reasons, while two people in the nearby town of Guantanamo were killed by falling trees. 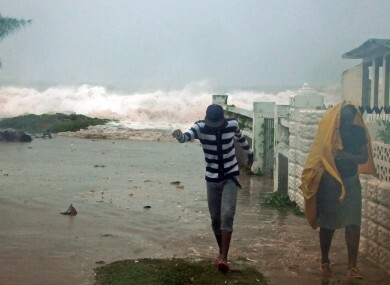 On Wednesday, Sandy unleashed its wrath on Jamaica, where one person died, and on Haiti, where nine people died and three others were reported missing. A resident drains mud from a flooded house after heavy rains brought by Hurricane Sandy in Port-au-Prince, Haiti (Image: Associated Press). The hurricane also affected the US naval base at Guantanamo Bay, where 167 terror suspects are held. Preliminary hearings for the accused Al-Qaeda mastermind of the 2000 bombing of the USS Cole were delayed. In Florida, authorities were on alert for tropical storm conditions, warning residents to prepare an emergency plan and supplies. Schools in the state’s southern counties of Palm Beach, Miami-Dade and Broward were closed for the rest of the week. International flights from major airports in the state were kept on schedule, though some Caribbean routes were suspended. Warnings about a possible “Frankenstorm” revived memories of the so-called “Perfect Storm” in 1991 that killed 13 people and caused $200 million in damage to the northeastern United States in late October and early November. “The potential is there for a significant storm,” WCNC-TV chief meteorologist Brad Panovich in Charlotte, North Carolina wrote on Facebook. Email “Hurricane Sandy kills 21 in Caribbean, takes aim at US”. Feedback on “Hurricane Sandy kills 21 in Caribbean, takes aim at US”.